This is the first book is what is going to be the NEXT BIG THING from Scholastic. 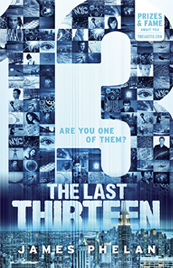 Like Conspiracy 365 which has come before the Last Thirteen series will see a book being released every month from September 2013 through to December 2014. The book opens with a dream sequence, Sam (the main character in this first instalment) comes face to face with a repulsive monster and he is witness to the world being destroyed. Just a dream you say…well here’s the kicker, Sam is one of the Last Thirteen…and his dreams come true. When helicopters land at school and soldiers take Sam away, the adventure really begins. The choppers are forced to crash land and a different group of dart gun wielding adults take Sam and his two new friends with them…to Switzerland. There is of course a secret academy hidden in the Swiss mountain ranges, where everything is explained, and Sam learns what his part will be in the future of humanity! Sound like your kind of book? Well there’s a lot of online add-ons for this series and if you go to the link below, you can read an excerpt, meet the author, and maybe even win a prize!